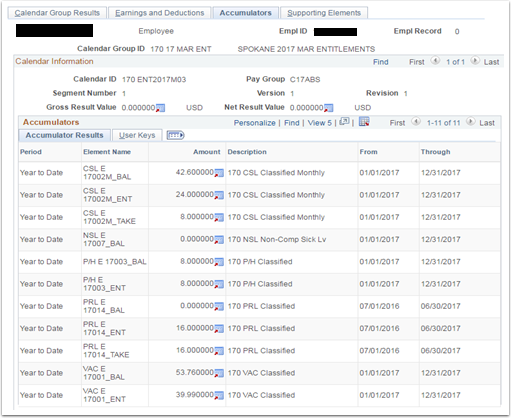 Purpose: Use this document to clear balances for terminated employees by using the Advance Off Cycle and Balance Adjustment in ctcLink. Create a termination line in Job Data (this can be Current or Future dated). Refer to the employee's current balance for validation purposes. These balances are the balances at the time of termination. They will not include the subtractions for the current Take or additions from the current month Entitlement. (Optional) Cancel any current absence process for your college. Run the current month Entitlement (Identify, Calculate and Suspend Active). The purpose of this will just be to look at what the employee will and would accrue at the time the entitlement is run. If the admin does not finalize, this will not save against the employee balances. (Optional) In the example, the admin can see that the March Entitlement run gives the terminated employee their last accrual (8 hours CSL, and 13.33 hours VAC). Final balances are also represented in the Accumulators tab. This is part of validation. Use the Advances drop down and add the employee(s) who are being terminated. For every EMPLID, select Advance Details. Select From and Thru Date to populate the dates that apply to the Entitlement ( in the example this means March would be 3/1/xxxx-3/31/xxxx). Select Apply and OK when all EMPLIDs have been interacted with. Select Create Calendar Group (this will not typically need changes). Select Finalize and a pop up box will let you know when process is complete. Optional: Confirm the employee balances by looking at the Review Balances screen. This will be updated with the new entitlements. Find the last finalized absence process for the employee (it must have been within the past 90 days). 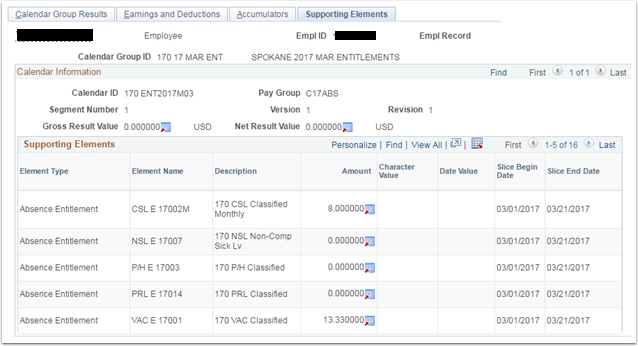 View the current balances in the Review Balances screen to create negative entries against the finalized absence calendar (in the example below, Feb. 2017 entitlement shown). 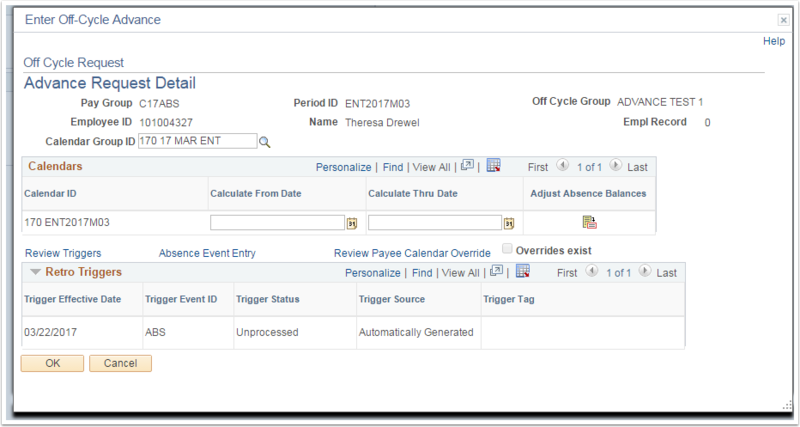 Run the off cycle process for the finalized Absence Calendar. View the balance in the Review Balances. The terminated employee now has 0 balances, a correcting entry to reference if they return, and will not get more balance given to them in the next entitlement run.